Over the years, social media has gone from being a luxury of a few brands to something essential and critical for every brand. At least that’s how it should be. Because if you’re not implementing social media in your marketing strategy, you’re missing out on some great opportunities. Social media is not just a tool that can help you increase brand awareness. However, to achieve those results, it’s important that you use social media the right way, and use proven methods for reaching success with it. Therefore, in this article, I’ll be providing you with the Most Effective Ways to Succeed On Social Media! Social media is the place for sharing visual content. We all know that posts with images get higher engagement. And platforms like Pinterest, Instagram & Snapchat are almost entirely based on visual content. 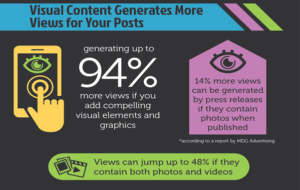 Content on social media can generate up to 94% more views if you have implemented compelling visual elements and graphics. And views can jump up to 48% if they contain both photos and videos. Those are big numbers, so adding visuals in all your social media content should no longer be an option, it should be something that goes without saying. No matter if you’re sharing promotional content or a press release on social media, visuals should be part of it. Therefore, putting a lot of energy and effort into creating appealing and eye-catching visuals should be something that you prioritize very highly on your to-do list. If you’re completely new to sharing visual content on social media, reading the step-by-step guide to “Implement Appealing Visual Content on Social Media With These Smart Tactics” is a must. There, you’ll learn everything you need to know to dominate your industry on social media with visuals. Trust is the most important thing when looking to drive sales because ultimately, that’s what will be the converting factor of a potential customer. Credibility and trust are two important parts of a successful social media marketing. Credibility helps make your brand look more popular and reliable and trusted to your audience, and thankfully, there are several ways you can work to achieve this on. While this might be controversial to some ears, it is true. The more followers you have, the more credibility your brand will look like it has, however, that does not mean that you should completely ignore other factors that also play a part in credibility, for example, responding to customer complaints on social media. Growing your page on social media goes hand-in-hand with sharing visual content, as visual content will help you get a bigger reach and more shares. But once you’ve mastered visual content and share it on a daily basis, you can start using other methods of increasing social media followers. Because this is an article on the Most Effective Ways to Succeed On Social Media, I will not go too much in detail on how you can grow your Instagram followers, but below, you can find guides to do so on the most popular social media platforms. The second, and probably the most effective way you can increase your brand’s credibility and trust on is to engage with your audience. On social media, this is a must. At least if you have the ambition of reaching success on there. Engaging with your audience, answer questions, talk to them about their day, discuss different subjects and give them your point of view on things are key elements to building trust. Doing so will help you build a genuine relationship with them, and most importantly, make them loyal followers, and ultimately loyal customers. Here’s an example of a customer-brand conversation that helps build trust. No matter if you’re receiving complaints, praises or questions, make sure you respond to them because they all help you build the picture that your audience can trust you for better or worse. When you share content on different social media platforms, utilize the customizable posting features on each social media platform. Because all platform is different, it is important that you do this. this includes the headline, image, and a description of the content you are sharing. When sharing content, make sure you’re utilizing headlines, images, and caption of what it is you’re sharing. While auto posting on social media is good for saving time, it isn’t always the most effective thing to do in terms of how your post will perform. 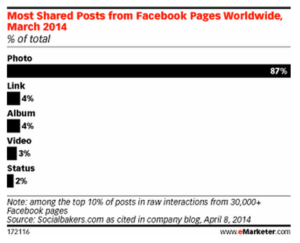 Tweaking your post on each platform can do a lot in terms of reach and engagement. On Facebook, for example, there are over 50 million business accounts, which means the competition of getting your audience’s attention is tough. That’s why it’s important that you use every trick possible to draw your audience’s attention. And the more you’re optimizing your post for the platform you’re sharing it on, the better will your post perform. On Facebook, using an appealing headline, an attention-grabbing image that indicates what your content is all about (and creates an interest in reading more), and of course an interesting, short snippet of text that gives a prejudice of what they content you’re sharing can do a lot for your post’s success. On platforms like Instagram, the caption is often less important. Instead, it is the visual that draws the interest. if the images succeed with creating that interest, people will carry on reading the caption – which also should be trimmed to perfection. By using tactics that make your content more appealing and click-worthy you can dramatically increase your social media effort’s results, and leverage all your competitors. Of course, this doesn’t come without hard work. Social media is one of the most powerful tools, but by not taking advantage of its full potential, marketers are missing out on some huge opportunities. Implementing these 3 Most Effective Ways to Succeed On Social Media media will help you skyrocket your results, increase your click-through rate and ultimately sales in the long run.